Think of spring and autumn flowering Cape bulbs, like Watsonias and Amaryllis belladonna, either of which would make a superb picture among drifts of different lavenders. The giant statice, Limonium perezii with its leathery green leaves and papery violet umbels is another ideal partner. All the different kinds of poppies and pinks, geraniums, scented-leaf pelargoniums, cistus (rock roses), salvias, pentstemons. 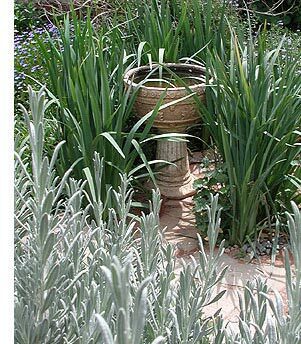 Lavender and olive trees: Space the lavender in even rows beneath the olives and clip the bushes regularly into neat rounds. Lavender and roses: Dwarf varieties of lavender make an excellent underplanting for roses. Lavender and annuals: Use lavender to make formal hedging around a simple geometry of square flower beds. Fill the squares with mixed annuals – one of the many seed mixes available are ideal for this.